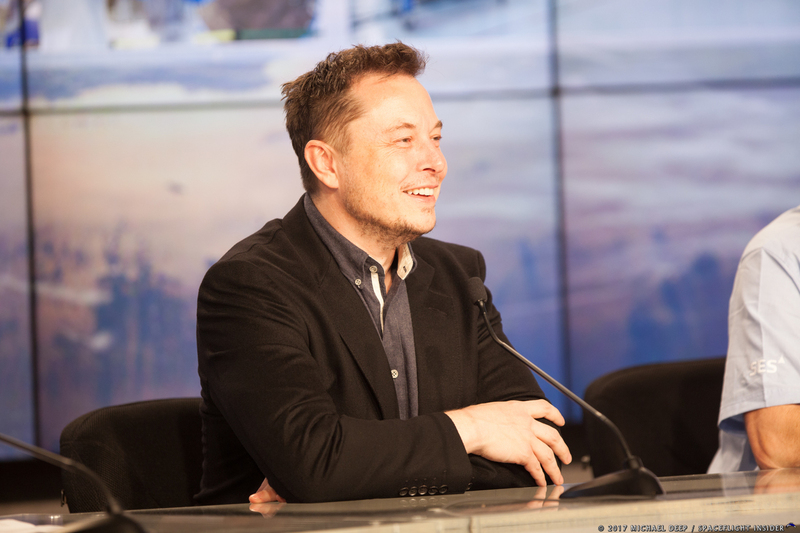 KENNEDY SPACE CENTER, Fla. — In a response to a question on the social media platform Twitter, Space Exploration Technologies (SpaceX) founder and CEO Elon Musk stated that, if everything goes according to plan, the first flight of the Falcon Heavy could take place as soon as this fall. According to the entrepreneur: “All Falcon Heavy cores should be at the Cape in two to three months, so launch should happen a month after that”. A rough estimate of this timeline places that flight in September. Musk first mentioned the Falcon Heavy in September 2005, with its first flight planned for 2013. However, the Hawthorne, California-based NewSpace firm has been busy with developing the infrastructure needed at four launch sites, perfecting and evolving its Falcon 9 family of launchers as well as carrying out an impressive 2017 launch manifest (with seven flights having taken place so far this year). Musk has noted in the past that the Falcon Heavy, with its three core stages and their 27 Merlin 1D rocket engines, has proven to be a rather challenging vehicle to produce. Even more so, considering that, like the Falcon 9, the Falcon Heavy’s three core stages have been shown carrying out a re-entry and landing – making any flight of the new launcher no less than three times as complex. SpaceX has stated that it is working to have Cape Canaveral Air Force Station’s Space Launch Complex 40, damaged during the Amos-6 explosion, repaired and returned to service later this summer. After this has happened, Falcon 9 flights should launch from SLC-40, with Kennedy Space Center’s Launch Complex 39A being used to launch the Falcon Heavy. SpaceX entered into a 20-year lease with NASA to use historic LC-39A in 2014. Late, but if they can cross this technological stage-gate, their lift capability would be the highest of any entity since the Shuttle, and payload since the Saturn V. Quite a few “lates” from their advertised plans, but their successes have been a positive disruption for the industry as a whole. Would NASA consider shifting deep space probe proposals (notions) to FH because SLS would still be expensive and untested in 12 months, following the Air Force example with X-37? Aside from SpaceX advertised ambitions (Moon, Mars) what other global entities and purposes might this capacity upgrade be useful for? Its fantastic! Because, elon is testing fh in september,than manning ot for moon flyby in 2019.this ,is an exact replay if you will of apollo 8.saturn 5 had been tested in nov,1967,manned a year later so its a repeat of apollo8.this is so so poignant.man on the moon 2 in my life!!!! Yes its wonderful!!! Then there’s the **really** big fracking rocket coming after Falcon Heavy. I’m betting they monetize the Raptor engine well before any Mars launches are done. I don’t know if this is technically feasible but maybe they can eventually replace the merlin 1D with the raptors? That might further improve F9/FH capabilities and provide a bridge between the falcon heavy and interplanetary transport system. I’ve been trying to think about what payload they might launch on the Falcon heavy first flight. Sure it would be amusing and amazing to launch a piece of cheese or Photograph a Model S in LEO! I think that their team might want to conduct some sort of research with the raptor engine. Say maybe a mini third stage in a payload fairing consisting of 2 carbon tanks filled with CH4/LOX and a raptor engine. Just to fire it in space and then relight. Film and record data on the CH4 in flight and monitor the new engine on two burns. Ah, by now the payload is set already, and I”ll just have to wait and see. It was just fun to posit this.